The small wonders of nature never cease to amaze me. My husband always reminds me to be open to noticing . . . . You never know what you’ll be privileged to see. Sometimes we find hidden little surprises in our photos only when we get them home and open up the image on the computer. Such was the case when I noticed the tiny little ants crawling inside this beautiful Blue Morning Glory above. On a recent hike at Pelican Island NWR, we were struck by a powerful, incessant humming sound, alternating between a deafening roar and periodic silence. The source of the buzz was nearly impossible to detect till my husband spied this little well-camouflaged 3/4″ long Cicada. 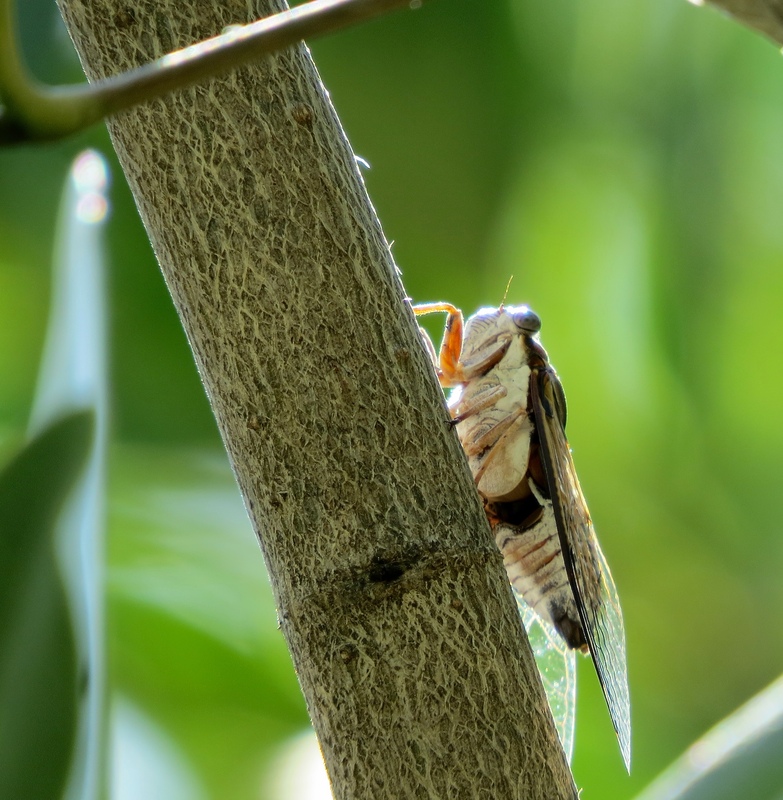 According to National Geographic: “Some cicadas produce loud, noisy calls that can be heard up to 1 mile (1.5 km) away.”! Walking along the pathway in Yamato Scrub can be a hazard. If you don’t look carefully where you’re going, you might run head on into this Giant Silk Orb Weaver spider! These 4+” long insects weave huge, low-hanging webs that attach to tree branches alongside the paths. For more fascinating info about these gentle but scary-looking insects, click here. Last week my husband caught sight of a small blob on a narrow branch floating in the pond. Zooming in with a long lens, we realized that he’d actually discovered a very young Brown Basilisk Lizard. This curious creature, with his wrinkly skin and sharp little teeth has “very large feet that are webbed. They are able to go across the water without sinking as long as they move at a fast speed. The rate is about 7 miles per hour.” (http://www.bioexpedition.com/common-basilisk/)! 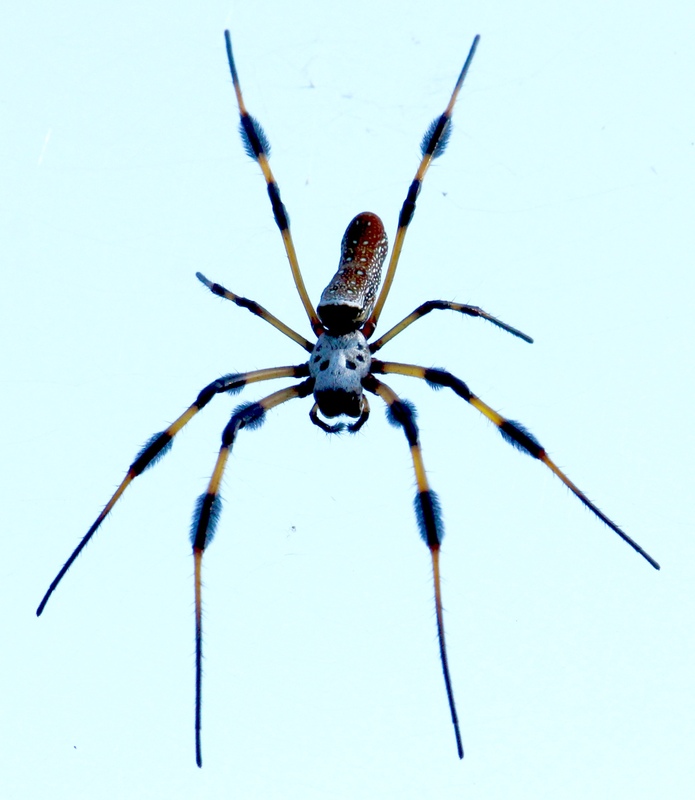 This entry was posted in Marsh/Wetlands and tagged Orb Weaver. Bookmark the permalink. Thanks, Amy. I recall being just amazed at the size of both the spider AND the giant web, the first time I saw an Orb Weaver! A different and very interesting post BJ, it is amazing what unexpected creatures we pick up with our cameras sometimes. Thanks for sharing! Thanks for stopping by and for your comment, AB. So true, and part of why I almost never take a walk without my camera. Wonderful images of things that most folks would miss. The diversity of potential subjects is amazing and it’s especially cool when you can capture them in images that you can share with others. I particularly enjoyed the shot of the lizard–somehow he seems energetic and inquisitive, like most young critters. Thanks, Mike! That lizard is so secretive and hard to see as an adult, too, but so fascinating – and very energetic! It’s not native to Florida, but we see them often. This is a good post to inaugurate October. I was just remarking today that it’s beginning to feel like “fall”, even here in Southeast Florida and the wetlands. Never cease to amaze me either! The more I look, the more impressed I become. I love it when I’m focusing on one subject, and suddenly a tiny little second, or even third, subject pops into the viewfinder.